Yesterday I posted a photo from Canaan Gap, and I’m going to do the same today. I wasn’t expecting too much when I planned to visit this site, but I was pleasantly surprised to find many cool petroglyphs when I arrived. 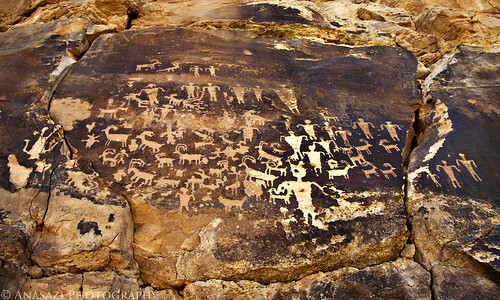 This was the largest panel at the site, and it kind of reminds me of the Great Hunt Panel in Nine Mile Canyon because of the way the figures are all grouped together. Another interesting figure in this panel is the upside down anthropomorph located all the way on the left side.